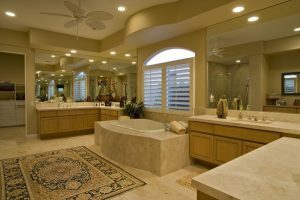 Learn what goes into remodeling a bathroom. So, you’re thinking of remodeling your bathroom. You probably have a vague idea of the color scheme and overall feeling you’d like to have in your new bathroom; however, the details and logistics of a remodel can be overwhelming. Before you run out of steam with your remodel, consider these remodeling tips to make the most out of your space. Elements of bathrooms come in standard measurements to make repairs and remodeling a tad easier. A common bathroom layout has all of the plumbing on one side of the wall and the air vents on the other. Tubs, toilets, single and double sinks all have standard measurements for height, width, and depth and have preferred space ranges for them so you can use your bathroom comfortably. However, this doesn’t mean you must get a specific size tub or toilet, as there are a variety of elements you can choose from. For example, a bathtub can be a soaker tub, drop-in tub, or an apron-front tub; each has their own benefits and require a different amount of space. For some unique design ideas or if you have a very small bathroom, you can consider floating elements, like sinks on pedestals or units mounted into studs on the wall to make your space feel larger or more modern. Understanding how all of these elements will feel in your space will help optimize the functionality of your new bathroom. Since bathrooms are typically a small space, a remodeling tip that designers use is getting a few high-end finishes to make your space seem luxurious. While your budget may not abide expensive toilets and tubs, take a look at high-end wall coverings, floor coverings, or countertops. You may be surprised since you’ll be purchasing a smaller amount of them, how easily they fit in your budget. Sometimes, bathroom doors get left open which means that any you or any guest in your home walking by the bathroom will see the toilet. It’s definitely not the most aesthetically pleasing element in the bathroom for sure. If you’re hoping for a zen, spa-like bathroom, highlighting the toilet can weaken that aesthetic, but you can use cabinetry, a hutch, or a wall to disguise your toilet. This entry was posted on Friday, December 8th, 2017 at 3:11 pm. Both comments and pings are currently closed.